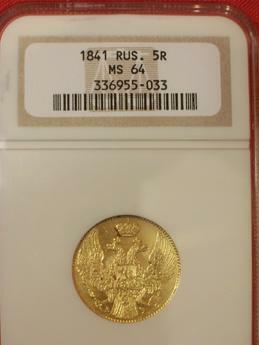 You are looking at a 1841 5 Gold Rouble graded by NGC (Numismatic Guaranty Corporation of America) MS-64. This coin was minted during the reign of Czar Nicholas I (1825-1855). Limited quantities, great condition. 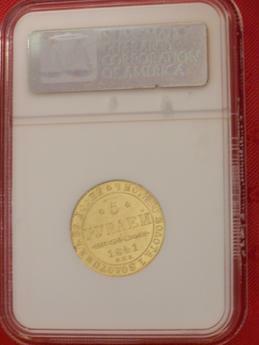 This coin is in MS (Mint State) and very rare in this condition. Gold is at a 25 year high! It is currently at $661 an ounce and it is going up and up and up! DISCLAIMER: Since this item may have been previously owned, the descriptions are made to the best of our ability, research and knowledge.. Any error or omission, is not made to deceive or mislead. This is being SOLD "AS IS" so please don't hesitate to ask any questions prior to purchasing and we will be happy to answer them. Not responsible for lost or damage of uninsured items!